The Fine Motor Fun® kit is a must for all children who need a little extra input in the area of their fine motor skills. 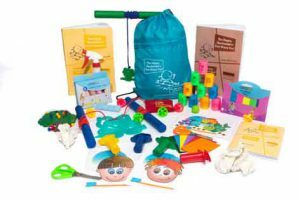 In addition, it is a perfect home kit in support of those who are receiving specialist intervention to address fine motor, pencil control and handwriting concerns that so often lead to the need for occupational therapy activities for children. This activity pack of occupational therapy activities for children, which comes with a clearly laid out parent booklet explaining how to derive optimal benefit from each activity, has been specifically designed to target the muscle groups and movement patterns critical for pencil grip, pencil control and handwriting. Spend 15 minutes 4 times a week with your child working consistently through these activities, and you will see an improvement in their skills. Bulging with 15 different fun activities, most of them re-usable, muscle development is the name of the game. These activities have been selected as the top favourites (both in terms of fun and muscle development) in the development of the fine motor muscles and movement patterns required for developing pencil control. Dive into this treasure bag, have fun and develop those muscles! As an occupational therapist, I find the Fine Motor Fun kit to be a useful tool for equipping parents to continue and promote fine motor strengthening in the home environment. The easy to understand parent manual that comes with the kit, takes one through each activity with clear instructions and makes one aware of what to avoid and encourage. The Fine Motor Fun kit is packed with numerous activities that are appealing and fun for children. These activities are specifically and expertly developed to strengthen the muscles required for good fine motor control and handwriting. We promote the use of the Fine Motor Fun kit with many of the families with whom we work, because we see significant progress and improvements in the children who regularly partake in these activities. Nicole Painter, Occupational Therapist, Tokai, Cape Town.